When you visit to foreign countries of old history, you will be amazed at old castles they have. At first, we are surprised at the beautiful castle which looks just cut-and pasted from a fairy tale, and amazed again by the fact that it has been coming down for over the hundreds of years. Tourists will continue to visit there, appreciating that how this beautiful castle still remains. However, Korea also has many traditional buildings coming down through a few hundred. The best one is a Korean-style old house. Although it is not as high as other foreign castles, the whole structure and the view of the house is a piece of the artwork. It is a harmony of Korean style building placement and the composition of natural garden. It is said to be admirable even to the modern architects. From now on, let’s go to see the grandeur and beautiful ancient houses representing Korea. An ancient house Sunkyeojang, located at Gangneung, was originally built by the 11th descendants of Prince Hyo-nyeong, the older brother of King Sejong, and has come down to the present going through the work of enlargement for 10 generations. This is a typical house for the gentry which comprises 99 units of area, and has higher value on its prototype which was preserved almost perfectly for a long period of 300 years. In 2000, the Korea Broadcasting Cooperation chose Sunkyojang as the best traditional house of Korea of 20 century. This place has been drawing people’s attention as a film location for various dramas and movies including “Man of the Princess” which recently drew a large popularity. In addition, this place is often shown as a background in many programs on TV, and also became a visiting place for the ministers of tourism of Korea, China and Japan. At this point, there is something which should be clarified. Koreans are familiar with the term, ‘a tile-roofed house with 99 units’. Then, why didn’t they build 100 units, adding one more unit? This was associated with the taboos of the past. Due to the fact that only the palace for a king’s residence was allowed to be built more than 100 units of area, so the civilian house was restricted to 99 units utmost since no one could not live in a larger house than King’s, as thought to be a general truth of the reason. This is proved by the story that Leem Sang-ok, a wealthy merchant of the latter period of Joseon Dynasty, got all sorts of sufferings from the accusation of building more than 100 units. Reaching to the end of the former Korea, with the regulation becoming disturbed, the cases of building over 100 units of houses gradually increased. However, on the whole, the limit of 99 units has been well kept. By the way the ‘unit’ means the land size not a room. Sunkyeojang is located in front of the Maewalldang memorial place where you can see after the Gyeongpo intersection and turning left on the Unjung intersection. It opens for public from 9 am to 6 pm in summer, from 9 am and to 5 pm moved up by one hour in winter, and admission fee is 3000 won for an adult. If you come earlier,, you can enjoy the place more comfortably with introduction by commentator. Smoking is prohibited all over the area as the whole buildings were made of wood. A lodging experience is a representative and practical use of this place. With a large site and many buildings, 9 choices for lodging, from a tile-roofed house for the group to a thatched house for the elegant residence, are prepared without missing anything. Although cooking is not allowed for safety of the building, lower prices and cozy facility is attractive enough. Besides, the cultural experience is also very plentiful. Traditional food, folk play, courtesy, and a public performance experience are made ready basically, and a finishing school and calligraphy school are opened on not-permanent standing. And in 2009, a library, holding above 2000 copies, will be made in Yulwhadang, a gusting room in Sunkyeojang, which will introduce visitors to the joy of reading. Moreover, surroundings are full of famous attractions such as Gyungpodae, Jungdongjin, Ojukheon, Odae Mountain., Seorak Mountain, etc. The number of tourists visiting Gangneung continuously increases. Before looking into the history of Songso ancient house, we need to look over the history of the Shims of Cheongsong area. The Shims, started by the originator Shim Hong-bu during the reign of King Choong-yul of Goryeo dynasty, settled in Cheongsong area which became a place of their origin. Their power reached the highest during the reign of King Gong-min and a King Yu. The two prominent figures from the Shims then were brothers, Shim Duk-bu and Shim Uen-bu. The older brother, Shim Duk- bu had served the ministry as a meritorious retainer for the foundation of a country, and the daughter of his fifth son Shim On became an Empress Sohyeon, a wife of the King Sejong in Joseon Dynasty. On the other hand, the younger brother Shim Uen-bu, unlike his older brother, opposed to the dynasty revolution and went into the Dumundong confining himself at home, and the rest of his descendents also stepped down from the government and came back to their hometown, Cheongsong, following the will of an ancestor. They worked together in cooperation and brought the wealth enough to be one of two richest families with the Choi’s of Gyeongju, the southeast region of Korea. The myth of a person who owns fields yielding as much as 10,000 seok of rice over 9 generations, were born from them. Among them, Songso Shim Ho-teak, a 7th generation descendant, built the Songso ancient house in 1880, naming it under his pseudonym. Songso ancient house has a typical upper-class house configuration of 7 sections and 99 units of area, and with being recognized of the almost perfectly preserved value, was designated as an Nationally Important Folk Material No.250. Having been neglected for 20 years since the descendants left, it was reborn as a hands-on experiencing place of Korean-style house after repaired in July 2010. The change proved to be successful by receiving the best award called, the Star of Korea Tourism, in lodging. The look of a tall front gate made of 7 units, standing in the entrance, overwhelms the visitors. Entering the gate, there appears a garden where maple trees and pine trees were planted. Sarangche, men’s space appears on the right side of it. Looking at the view from high above, you will learn that entire place is divided each into spaces for living, working, and welcoming guests. Besides, each building has its own independent yard, so the total is 9. In Songso ancient house, you can find many interesting details everywhere. First of all, entering into the tall gate, ‘ㄱ’ shaped-wall, called heotdam, separating wall. It was used to prevent children and women of inside from encountering the male guests visiting sarangche. In addition, when you take a closer look at the Kkotdam, a flower wall, you can find the hole in line with eye-level, which is said to be a hole used for the children and women inside of the house to see the outside. Who knows it could be used vice-versa? Also, when you see the roof, a little bit scary picture is painted at the edge. This is said to be the purpose to expel the evil spirit. If you see the upper part, you can see the two holes which were made for the birds to build a nest easily, and recognize the warm heart of ancestors. Lastly, we will take a look at the byeolche, women’s space, sticking out of the side of Songso ancient house. This place was a space for the unmarried women in Songso ancient house, and the girls over seven years old should move to byeolche and live locked in the place until she gets married. This place was indeed a space for raising the women of a boudoir who hadn’t experienced the outside. However, at present, this place turns to be the most expensive accommodation because of its uniqueness and a harmony with surrounding landscape. How about staying one night here and feeling the mood of the lady who dreamt of a dear future husband? Imcheonggak is a unusual Korean-style house in a sense that the present appearance is quite different from the one in the past. In the early days, Imcheonggak stood with a proud of its dignified appearance of 99 units of area. However, since it was found that 9 pro-independence fighters were born in this house, Japanese demolished almost half of the house by putting down the central railroad in the front of the house. In addition, as the descendants refused to add themselves to Japanese family register, Japanese confiscate their house and sold to others. Since then, the descendants had to wander around orphanages. Imcheonggak is one of the oldest ancient houses, and used to be outstanding in its scale until 19 century. Built in 1519, its scale has become huge by continuous expansion. It has the board written by Lee Hyun-bo and Lee Hang-bok, the prominent civil ministers in the mid Joseon Dynasty, so we can imagine their high social reputation was. The full figure of Imcheonggak has a flat formation which looks like a Chinese letter, ‘用 (lyong)’’. It tells that it separated each place by gender and social status. Also, Gunjajeong, located at the center of Imcheonggak and later designated as National Treasure, is for welcoming guests, which looks like a letter, ‘丁(jeong)’. This is the best spot to take a view of Nakdong River flowing over the front and the Yeunnam Mountain surrounding the building. Ancient houses were not built with 99 units of area from the beginning. They got bigger and bigger for a long period of time. It was for practical use rather than ostentation. When the house was crowded with peoples, it needed a lot of rooms for many literary guests and travelers from all over the country as well as for the family, relatives, and the servants to take their own space. Distinguished family always emphasized to welcome their guests. With this, we can see the fact that what they concerned about is a human being rather than property. The biggest lesson, which the ancient house is giving to us, seems that we should live together, harmonized with others. Han River, which passes through Seoul is considered the most significant river among Koreans. You can enjoy the view from riverside or neighboring parks. However, there are also other places to recommend. If you want to see the river comfortably inside, regardless of weather, go to the Han River observation cafes. You might feel different from the other cafes as all of these observation cafes were built on the Han River Bridge. It will be a fun to find out the uniqueness of each cafe. Han River has total of 10 observation cafes over seven Bridges. Among these, we chose six cafes thought to be more interesting and unique than the rest. Let’s find out the unusual and attractive cafes to enjoy the Han River at a glance. The cold wind always comes with the river, so don’t forget to wear the warmest outfit. Cloud Cafe and Red Sky Cafe are located each at upstream and downstream of Dongjak Bridge. Both cafes occupy three floors of the building from 3rd to 5th, and outdoor observation deck is on 6th floor. The operating hour is from 10 am to 2 am from March to October during the high-demand season, and from 10 am to midnight from November to February during the low-demand season. For those of you who want to go to either one of cafes mentioned above, we recommend you to take a bus no.502 or a subway to Dongjak station (line no.4). It takes only three minutes’ walk from where you get off. To Cloud café, go to exit no.1, and to Red Sky café go to exit no.2. For drivers, there is a parking lot over a Dongjak Bridge, which charges 300 won per 10 minutes. If you park at other parking lot in Banpo Hangang Park, it costs 1000 won per 30 minutes, from Monday through Saturday, and 200 won per extra 10 minutes. For whole day, it costs 10,000 won. On Sunday and national holidays, it is free of charge. Cloud cafe and Red Sky cafe draw attention as a comfortable resting place with lights from the ceiling and scents of aroma. In addition, both of these places have been recognized as the most appropriate places to see the fountain show around Banpo Bridge, floating Island, and 63 Building, and also beautiful scenery of the Han River with sunset. Of course, they serve the wonderful cuisine. If you ever used a water-taxi, you’ll get 20% discount in all menus of Red Sky cafe. Red Sky cafe is the only one in alliance with Han River water-taxi, so do not miss the chance! Ariddaum Yangwha is located at upstream direction of Yangwha Bridge, and Ariddaum Sunneu is located at downstream direction separately. They stand facing each other with Yangwha Bridge between them. They have oriental and occidental themes. Ariddaum Yangwha adopted the oriental lattice interior, and Ariddaum Sunneu adopted the occidental tables and chairs, separately. Unlike the other observation cafes, these two are located on a pedestrian passage. So, in order to reach from the waterside of the Han River, you have to use a rather unique elevator moving on a slant line. In terms of transportation, you can take a walk for about 15 minutes from the exit no.3 in Sunneudo subway station (line no.9), or use the bus either no.604, 5712, 6712 or 6716. The operating hour is from 10 am to midnight in high-demand season (Mar.-Oct.), and from 10 am to 11 pm in low-demand season (Nov.-Feb.). Comparing to the previous Cloud and Red Sky Cafe, you can tell the difference from their operating hour. However, the same parking charge applies to all the Han Liver Cafes. Both of these cafes sit in back-to-back position in direction, so each opposite side of the wall is toward a different view. The Cafe Ariddaum Yangwha avails the views of the Han River, Dangsan Railroad Bridge, Yeouido, etc., and the Cafe Ariddaum Seoneu avails the views of Seoneudo Park, Seongsan Bridge and World Cup Fountain. In addition, they sell the coffee from East Timor through fair trade, and all menus are free of sugar, trans fat and chemical additives at all. They sell not only coffee but also they prepare alcohol liquors such as wine, makgeoli (rice wine), cocktail, etc. and also various drinks like herbal tea and juice, which satisfies the various tastes of people at the same time. On July 2011, 12 major facilities on Han River were renamed. Now, they all have new names after pure Korean words. Marushimteo is also one of the, which changed its name, which used to be ‘River View Spring’. The operating hour is from 10 am to 11 pm. Walk toward Jamsil Bridge for about 10 minutes from exit no.7 in Jamsil subway station (line no.2), or by bus no.302, 303, 320, 8361, 2412, 2415, 3215, and 3216 to get to the café.. This place has been managed by the Seoul Foundation of Women & Family, and used as a place for women. Recently a female owned flower shop named ‘travelling painter’ moved into the place. You can buy some various flowers and flowerpots as well. Marushimteo also provides useful information on employment for women and promoting programs. It sells coffee, fruit juice, jujube tea, sweet pumpkin, makgeoli (rice wine) , etc. The price is lower than elsewhere. Computers are set up for visitors’ convenience. Besides, after 8 o’clock in the evening, the observation deck on 3rd floor turns off the whole internal lights to provide the vivid night view. It will be more romantic, if you come with your lover. Well, there is one more place you shouldn’t miss. It is “Jamsil Under-water Reservoir Fish Road” which is a pathway to make fish easily move up to the uperstream of the river. A little fish also can pass through the artificial valley as it is only 10cms high. Every Saturday from April to October, from 11:00am to 12:30pm, an interesting and educational program named ’The Han River Fish Ecology Classroom opens for public. The target audiences are from kindergarten kids to junior high school students, including their family. Unfortunately, the program doesn’t open in winter. Hannam Semal cafe built on the southern end of Hannam Bridge is the first Han River Observation café among others. From here, you can see the Namsan Mountain, Banpo Bridge, moonlight rainbow, Jamwon Han River Park at a glance. The operating hour is from 10 am to midnight in high-demand season, and from 10 am to 11 pm in low-demand season. You can come here by a transfer bus from exit no.4 in Sinsa subway station (line no.3) or exit no.6 or 7 in Nonhyeon subway station (line no.3). You can also come by bus either one of no.140, 142, 144, 241, 402, 408, 420, 421, 470, 471, or 472. The most attractive thing of Semal Cafe is to be specialized for bike users. To prevent losing the bikes, it operates a unique place called “housing bike keeping place” and keep developing the set menu for bike users. In addition, in winter time, this place provides a free experience of herbal teas event for bike users. Moreover, this place has been the most distinguished by bike manias for its convenience. The most popular menu of this place is a three color makgeoli cocktail. This unique menu is a magical cocktail which has three colors and three tastes. Along with this, you can taste various oriental teas such as Yeosu stone-mountain organic-farming citron tea, south sea organic-farming plum tea, etc. Such as Yangwha Bridge, the coffee brought from the East Timor in fare trade, is very popular. Another consideration of Semal Cafe is mat-rental. It is available with 3000won in deposit. So you can enjoy the moment sitting on the picnic mat in the Han River Park from the spring to the autumn. As such, the Semal cafe sets a good example as a first-born brother, to think about a minor but essential and short-cut policy to make the Han River cafes be the friends of the citizens. Just as the winter sea, compared to the summer, winter river gets relatively few visitors. Meanwhile, this cold season could be the best opportunity to monopolize the whole view ofHnaRiveron your own. Why don’t you refresh yourself with the warmest tea over the river? ㆍ Sattorova Parvina (Uzbekistan, 5th WSK) attended Blue House, on behalf of WSK members, for PCNB business report on 23rd Feb, 2012. ㆍ New year celebration ceremony for 6th WSK is scheduled to be held. Further information will be noticed ahead. 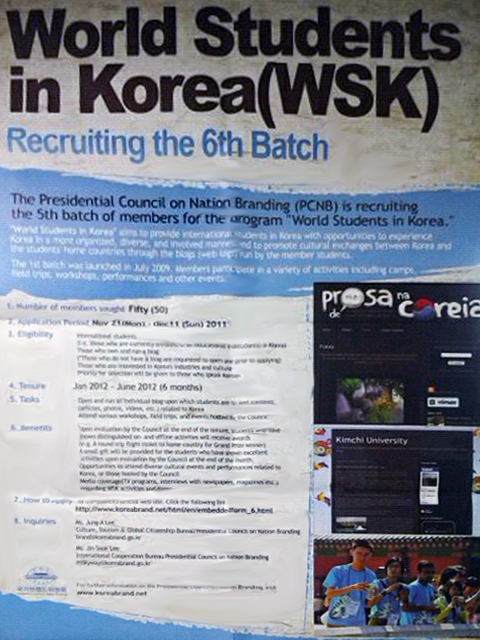 “World Students in Korea” aims to provide international students in Korea with opportunities to experience Korea in a more organized, diverse, and involved manner and to promote cultural exchanges between Korea and the students’ home countries through the blogs (web logs) run by the member students. The 1st batch was launched in July 2009. Members participate in a variety of activities including camps, field trips, workshops, performances and other events. – A small gift will be provided for the students who have shown excellent activities upon evaluation by the Council at the end of the month. 대통령직속 기구인 국가브랜드위원회가 World Students in Korea 제 6기 멤버들을 모집합니다. World Students in Korea는 한국에서 유학하고 있는 외국인 학생들에게 한국을 보다 다양하고 심도 있게 경험할 수 있는 기회의 장을 제공하며, 학생들이 운영하는 블로그를 통하여 한국과 학생들 자국 간의 관계를 더욱 돈독히 하는 데 목적을 두고 있는 프로그램입니다. 2009년 7월 제 1기가 선발되었고, 그간 캠프, 문화탐방, 공연관람, 워크숍, 간담회 등 다양한 체험과 활동이 있었습니다. 대한민국의 온라인 홍보대사로 활약하게 될 WSK 제 6기 모집에 외국인 유학생들의 많은 지원 바랍니다. 국가브랜드위원회 공식 웹사이트를 통한 직접 온라인 접수. 아래의 링크를 클릭하세요. Do you remember what happened on July 7th, 2011? Korea won a bid to host the Winter Olympic game in Pyeongchang. It was a huge triumph made of relentless challenge, support from whole nation and wish that moved IOC members. On Feb 9th, 2018, Pyeongchang will draw a lot of attention from globe. Koreans as well as foreigners will gather around the sites or in front of TV. Expecially for those who are on the sites will spend some extra time on looking around the area before opening the game. What are the attractions in Pyeongchang that we can introduce? Here they are. Daegwanryeong, the entrance of Taebaek mountains, is well known for sheep ranches, plantation over high mountains and ski resorts. Ranches are as much exotic as Swiss and Austria because it is not easy to see ranches over high mountains. Samyang and Yangtae ranches are the popular ones, however, they are slightly different. Let’s go to Samyang ranch first. Take Yeongdong highway to Gangreung and exit at Heuinggye IC. Then, make a left turn, and pass a three-way intersection. Go straight and turn right at the next corner. Keep driving 8 more kilometers. Samyang ranch is the largest one in Asia, located 1,140 meters high from sea level and 1,983 square meters in size. The ranch runs shuttle bus, which is nonstop to the peak. However when coming down, you can get off at either of four stops and take a walk. Shuttle bus doesn’t run in winter. Admission fee is 7,000 won for adult and 5,000 won for children. There are milk cow, sheep, Tajo, rabbit and goat in the ranch. Among them, the flock of milk cow and sheep are the ‘best’. The perfect season for visiting is spring and summer when they are all outside. If you visit in winter you’ll see them in their cages. On the side way to the peak, there is a windmill electric generator complex. It looks simple but ‘literally’ generates 67% of whole electricity in Gangreung. There are TV drama sets and movie sets such as trees shown in the movie, Love Story. A fish called Hwangtae Deokjang is very well known. If you walk down from the top, you can’t miss anything special. Next, let’s move on to Yangtae ranch. It is located 805 meters high and 200,000 square meters in size. Land size is just 1/100 of Samyang ranch but it is as famous as Samyang ranch. Although it is smaller than that, it is way more comfortable to take a walk the whole area, watching sheeps. It is also close from Samyang ranch, which is just 12 kilometers away, so you can stop by after another. The sheep goes back in their indoor cage at 4 so you’d better manage your time to see them. You can feed any animal in Samyang ranch but in Yangtae ranch you can only feed sheep because as you can see from the word ‘Yangtae’, which means ‘the flock of sheep’, they have only sheep. Instead, there is no admission fee in Yangtae ranch. There is only feeding fee, 3,500 won for adult and 3,000 won for children. Unlike Samyang ranch, there is no shuttle bus in Yangtae ranch. It is long enough to take a walk and look around. You will find a bigger hut at the top of the hill, which was on the movie, ‘A man who has gone to Mars’. By the way, you don’t have to worry about getting bitten when feeding hay to milk cow and sheep. They don’t have upper teeth so feed them freely. If you have some knowledge of Korean history, you might recognize the Octagonal nine-story pagoda in Woljeong Temple was built in the early years of Goryeo dynasty. It is regarded as one of the greatest heritage in Korean history and the one that made its temple known throughout Korea. As Woljeong temple is a temple of name established in Ohdae mountain by Buddist monk Jajangyulsa, a number of people have visited the temple. If you want to visit here, take a bus at East Seoul bus terminal to Jinbu suburban bus terminal. Then take a bus toward Woljeong temple. If you drive, get on the Central express highway, and move over to the Yeongdong express highway. After you come off the highway at Jinbu IC, you are almost there. In addition, Fir tree road also attracts tourists. The road has become known after it appeared in a mobile phone ads. It has become a ‘must’ go place in Pyeongchang now. Just typing ‘firs’ on the internet search engine, you’ll find Ohdae mountain firs forest. You’ll be overwhelmed with the forest with a full of fir trees. Firs are vulnerable to pollution, so it’s not easy to see them in cities. That makes them truly valuable. To enter Firs road, you should get into Woljeong temple. With admission fee 3,000 won, you will find pavilions and octagonal nine story pagoda. Passing by pine trees at entrance gate of walk road, you will face firs road. Flowing stream will satisfy your all senses. Fir trees grow by 40 meters high and 1.5 meters round. Firs here have grown to the highest. They don’t stretch out their branches very much so you can still find the pieces of sky and stream through them. Road is as straight forward as trees stand upright. You will feel more comfortable with them. Sometimes, when you take a walk along the street with a deep thought, you might see a monk coming from the opposite side of you. Just greet him, slightly nodding your head with holding your hands together. It is a courtesy for you to greet first because you are visiting a temple. As the visitors have to walk on the same road when going back, so the expression above sounds really fit. Everywhere in Pyeongchang is just nice for taking photos. One of the best photo zones is Herbnara. There are only herbs, not flower trees, however, it can be the most favorable photo zone. For directions, after Myenon IC through Yeongdong express highway from Seoul, you’ll get to the area around Phynix park and Heungjeong valley. Well, from Gangreung, you should pass through Jangpyeong IC and get to Bongpyeong-myeon and Heungjeong valley. Admission fee is 7,000 won in summer and 5,000 won in winter. Infants with family are free of charge and a group of infants is 3,000 won regardless of the number of them. Herbnara opens at 9 and closes at 6. Latest entry is 4:30, so don’t be late! When you pass by the ticket both after a bridge in valley, you will see welcoming signboard, written “Home of scents, Herbnara”. Amazed at hand paintings, you’ll enter the medieval age style of garden. The farm consists of eight themes. The first theme you will meet is a medieval garden. There are mini windmills, fountains and sculptures. They are very well harmonized with structures in the garden. You will definitely regret if you forget to bring either of digital camera or mobile phone camera. After medieval garden, you’ll meet with Shakespeare garden following Cottage garden, Butterfly garden and Rock garden. If you move forward, you’ll get to a palette garden which is full of colorful flowers. If you turn back, you will see children’s garden. Suddenly you’ll feel the herbal scents while taking a look. Smell the herbal scents, they will refresh yourself. Well, do you want to taste the herb? A restaurant named Jajaknamujib add herb in every food. They serve herbal tea, which makes you feel purified as well. They also have herbal ice cream, herbal bread and herbal jam. There are still many things to do. You can learn the use of herb and herbal products in herbal museum and herbal crafts room. In the hope of multiple culture center Pyeonggang garden runs Turkish museum which shows Turkish crafts. You can watch Korean old animation in animation forest of animation museum. Once in a while, if you are lucky enough, you will see some concerts held by Lee munsae, Noh yeongshim, and Lee ruma on starlight stage in an open-air theater. The music which covers the whole garden will touch your ears and refresh your mind. Did you enjoy the attractions of Pyeongchang Olympic city so far? We hope that Pyeongchang could be remembered not only just an Olympic city but a city which is beautiful and entitled enough to host the Olympic game. Gartner, known as an IT research and advisory firm, announces a notable ‘technology’ every year. It has introduced ten potential strategic technologies every October. The uprising technologies in 2012 were announced in Symposium/ IT Expo 2001, Orlando Florida. The top ten strategic technologies for 2012 include Media Tablets and Beyond, Mobile-Centric Applications and Interfaces, Contextual and Social User Experience, Internet of Things, App Stores and Marketplaces, Next-Generation Analytics, Big Data, In-Memory Computing, Extreme Low-Energy Servers, and Cloud Computing. There was a huge change in the list. The cloud computing which ranked first last year has dropped to 10th. Amid rising interests on developing effective energy-saving technologies, such as low energy servers, green IT and so on, Gartner expressed his interests in the effective use of energy. Let’s find out some of the technologies that drew his attention. Over the last 20 years, the user interface (UI)has changed a lot. Since the development of media tablets, UI has adopted the ‘touch’ function from ‘click’ function. Gartner predicted that’mouse’ and ‘keyboard’ applications that needed ‘click’ will be changed into the ‘touch’ applications. He added that applications will become more and more mobile-friendly solutions. That means the applications will be simpler easier to use in mobile devices. In addition, Gartner analyzed that a variety of applications with voice and motion recognition function will be shown up soon. At this moment, many companies are developinging the applications for a variety of mobile gadgets and technologies fitting into the gadgets. Efficient use of energy has always been an issue to all companies. Gartner has mentioned the importance of technologies related to ‘Green IT’ in ‘Strategic Technologies for 2010’. Once again, he mentioned energy efficiency in detail with Low-Energy Consuming servers for 2012. The more important the technology related to analysis becomes, the higher the frequency of using servers becomes. Fortunately, the technology that is not only low energy-consuming but also effective has emerged. Gartner said it is possible to do the 30 times or more processes. Moreover, the energy efficiency and speeding up the process is expected since the burden of the server would decrease as well. Gartner predicts low energy sever technology is likely to increase. Well, then, how about the prospect of Korea’s technologies this year? Let’s take a look. After the mainframe and client server era, a new platform, so-called ‘third platform’ is dominating IT field. New platform era based on development of mobile market, introduction to cloud service, SNS and big data technology, has begun, like a new platform era emerged on a 20 to 25 year cycle. The awareness on this matter will be expanded in 2012. Now, the era of multi-client devices has started. The supply of smartphone has already surpassed over desktop and laptop computer in terms of number. Multi-client environment is expected to be common as mobile devices in both shipments and expenditures would take over PC market in 2012. This change will prompt the change of application market including lead of control and OS through boosting private and cooperative market. It seems that mobile technology is the biggest issue nowadays. Maybe in near future, smartphones will replace PC. What kind of new technologies will emerge this year? It’s exciting. People want to have a better look and show off their charms by wearing new clothes and trying a new hairstyle. Well, there is nothing like accessories to complete the ‘better’ look. Every decorative itemsitem, such as hats and mufflers, can be called accessories. Today, we will go through the favorite accessories of Korean women in the Joseon Dynasty era. Hair ornaments, bracelets, rings and necklaces. They wore different ornaments by season, occasion and age. In addition, each accessory has its own story. For example, when family gets separated, they share each ring from a pair of rings, garakji. When husband died early, wife buried a ring of the pair with him and she kept the other to commemorate him. For that reason, garakji used to be made as a pair and actually bigger than present one. Let’s take a look at the accessories of women in the Joseon Dynasty era. Rings were the first ornament in history. In certain countries of Asia, people considered it like a charm and kept it very carefully. They were also called eesik, eedang or eehwan. Many gold crowns and delicately made-ornaments were excavated from many graves of the Three Kingdoms period. We can guess the metalwork technique of the era was very sophisticated and detailed. There are three types of earrings; simple, dangling and showy. The earrings of old times were made of gold, silver and bronze, but unfortunately the number of the earrings from Goryeo dynasty are very few. Did you know that men used to put on earrings in the past? The typical example is Hwarang in the Silla kingdom. They used to wear earrings as a symbol of youth and ability. According to the Annals of the Joseon dynasty, prince Yangpyeong put on big earrings when he was nine (in 1513) and it was common for prince to put on earrings back then. However, the earrings became unpopular since the Confucianism pervaded the whole country in the Joseon Dynasty era. Even the King Seonjo officially announced that it is the most undutiful thing to put on earrings because piercing is hurting the ancestrally inherited body. According to some recent studies on the era, scholars insist that the regulation was resulted from the economic crisis caused by importing too much gold and silver for earrings from China. Eventually, the men’s earrings were disappeared after King Seonjo era and women only put on earrings in wedding ceremony. For this reasons, the design of the earrings in Joseon dynasty became very simple. The history of exchanging rings went back 4800 years ago. In 16th century, the Tudor dynasty believed that the blood vessel of the 4th finger of left hand is connected to heart, and they put on wedding ring on 4th finger. Since then, it became customary in most countries. Garakji was mainly made of gold and silver but other materials were also used, such as lacquer, jade, quartz, green jadeite, amber, pearl, and copper. In Joseon dynasty, noblewomen and royal family put on different materials of rings by season and occasion. Gold rings from Oct. to Jan., silver lacquer rings from Feb. to Apr., jade or quartz rings were for Dano festival and regular lacquer rings were from dog days, boknal, to Sep. All of them were for having a natural and harmonious look, which are influenced by the formality of clothing and four seasons. Garakji was not only a love token but loyalty to the country as well. During Japanese invasion of 1592, a gisaeng, cultured women entertainers in the Joseon Dynasty era, called Nongae, hugged Japanese general and jumped down to the river, wearing 10 rings. Jinjoo local government designated Aug. 8th as the “Nongae Day” and has hosted many special events and donated hundreds of silver rings engraved “euiam”, which is the name of the rock she stepped on before jumping into the river, to supporting center. Norigae is a perfect accessory for women’s Hanbok. It is widely loved by all classes, from royal family to common people. Norigae was the most popular ornament during the Joseon Dynasty era, while the other accessories like necklaces and earrings became unpopular. There is no historical record on norigae. For your information, the Hanbok during the Silla kingdom and the Goryeo dynasty era doesn’t look like the one in these days. Instead of norigae, it was customary to hang pocket filled with gold bell or scent in the belt. Later in Joseon, they were replaced into the new born accessory, norigae. During the era, norigae was hung in the breast-tie of Hanbok. People wore more gorgeous norigae for royal functions and big festivities. Noblewomen used to inherit it to generation after generation. Norigae is consisted of ttidon, string, but also paemul(jewel), knot and sool(tassel). Ttidon is a tie to connect jewels and it is supposed to be hung in the breast-tie. Gold, silver, white jade, green jadeite and coral were used to make norigae. There are square, rectangular, round, flower and butterfly shaped ttidon. According to the number of jewels of it, it was called oijul-norigae or danjak-norigae(single jewel) and samjak-norigae(three jewel). Red, blue, yellow, pink, green, light purple and deep purple colors were used to make sool(tassels). Besides, some of norigaes were embroidered with a rhino horn, lotus flower, and herb that was belived to bring an eternal youth. Norigae represented not only the social status but also the wishes of women and ideologies for abundance, longevity and good luck. Binyeo is an ornamental hairpin used to hold a hair bun in place. We can still see old ladies wearing binyeo in countryside. Binyeo is classified into two kinds; a Jam and a Chae. Jam is a normal stick-shaped binyeo and Chae is a tong-shaped binyeo with decorations. Binyeo was allowed only for married women. The jewels, woods, animal horns and bones were used to make binyeos. According to the historical record, Binyeo was firstly used in the Three Kingdoms era. But it also became very detailed since King Yeongjo of the Joseon Dynasty era. The question is why he forced women to put on binyeo. In fact, in mid-Joseon Dynasty era, married women used to put on gachae (a wig) around hair. The higher the wig is, the higher their social status is. The most expensive wig cost almost same as a fine house. It caused a social problem. In addition, because of heavy wig, some women were suffering from neck sickness. Besides, they even decorated the wig with various accessories. For the reason, the wig was replaced into binyeo. There are also different types of binyeo for different seasons, occasions, and ages. Binyeo made of a plum tree and a bamboo or jade binyeo with a peony-shaped decoration was used in April, August, and September. Okbong binyeo, Wonang binyeo,Isaryeon binyeo were used to giled dangui, a type of upper garment for women in hanbok. In spring and autumn, women used to wear Moran or Maejuk binyeo with delicately decorated small hairpins called isaddeoljam on it., According to the character of occasions, they choose different materials of binyeo. The Ornaments have been with us throughout the history and represented women’s life. From now on, even small earrings will remind you the history. As the number of Korean women who entered the main stream of society increases, other countries in Asia started to have interest in women policy of Korea. Recently, there was a meaningful workshop where the other Asian countries can learn about Korean policy on women. Let’s take a look. 30 people including Cambodian and Indonesian government officials and Ngo members attended workshop on Capacity Building for Women’s Policy sponsored by Korean Women’s Development Institute to learn women policy from Sept. 18th to Oct.1st. They participated at lectures, discussions and site visit under the three themes on capacity building on; policy, economy, women rights and violence. The Buddhist country, Cambodia and the Muslim country, Indonesia have different cultural background, however, since 2000s they are actively working on the policy on gender equality. But women’s social status is still low due to the poverty, poor education, and conventional man chauvinism. What were the impressions that the experts from these two countries got from Korea? for justice democracy are speakers today.this is the first time to korea for both of them and they were very impressed by women’s liberation movement history and women’s policy.mukti apprciated hospitality saying”it is the first time for me to be herebut seoul is wellknown city in indonesia.korea is emerging as an economic superpower in the world.i’m looking forward to be here”.pakpahan was interested in korean women’s policy and she said korea abolished the head of the family system and korean women’s liberation movements are even if it is a small result. What is the Most Important Issue in Women’s policy in Tow Countries? There is an expression like this, “The women-friendly country is indeed a developed country.” Now, Korea is becoming a good model of high techniques and advanced policies. A good and comfortable society is not built by a specific person but by every single one of us. Isn’t it the first step of world peace to make the weak including women happy?